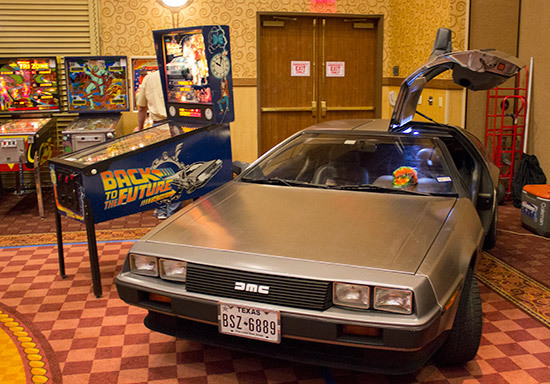 Last year's first Texas Pinball Festival held at the Embassy Suites in Frisco was so well received, the team had no hesitation in returning to the same venue in 2015. 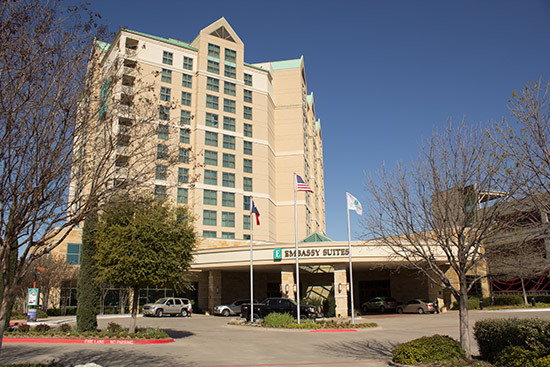 The upscale hotel is located next to the Dr. Pepper Ballpark and the Stonebriar Center shopping mall. 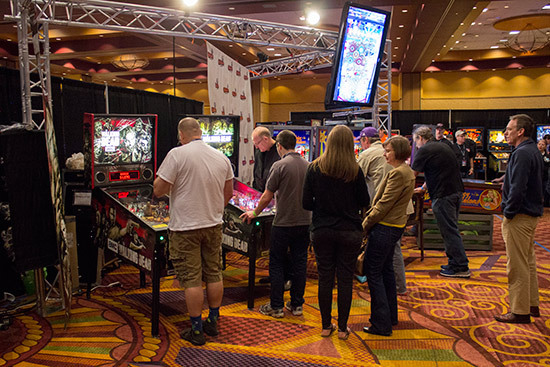 There are numerous shops and large stores in the vicinity, providing suitable distractions for non-pinball playing partners. 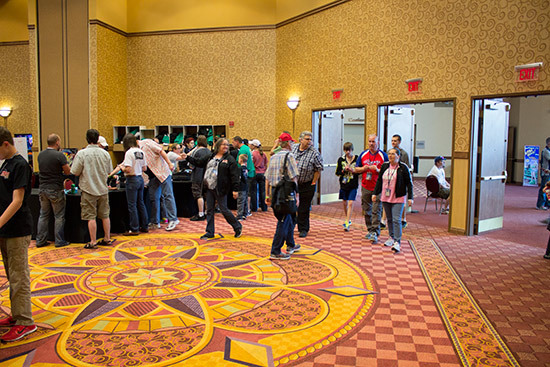 Pre-registered visitors could collect their show packs from the business centre just outside the main entrance, while on-the-day registration was handled just inside the hall. Entry cost $25 ($15 for kids) for the Friday session, $35 ($25) for Saturday and $20 ($10) for Sunday. A $60 ($35) weekend pass covering all three days was also available, while discounted tickets could be purchased in advance of the show. The show began officially at 5pm on Friday 27th March, although the tournaments area opened earlier to allow a longer qualifying period for the many competitions taking place. 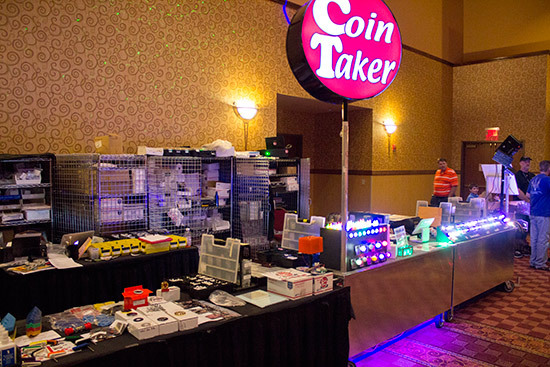 We will be updating this report with full details of the games and the vendors inside the hall, but here are our initial pictures from Friday. 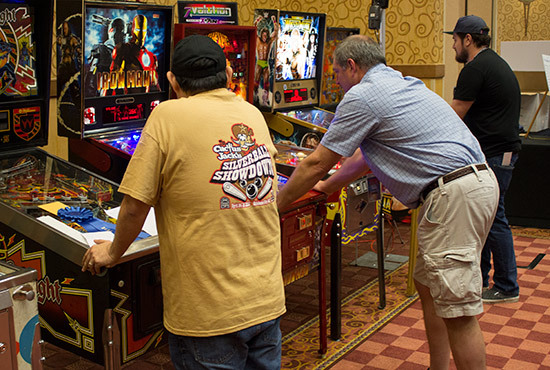 You can look around the Texas Pinball Festival show hall for yourself in our Twenty Minute Tour video of the show hall taken on Saturday night. 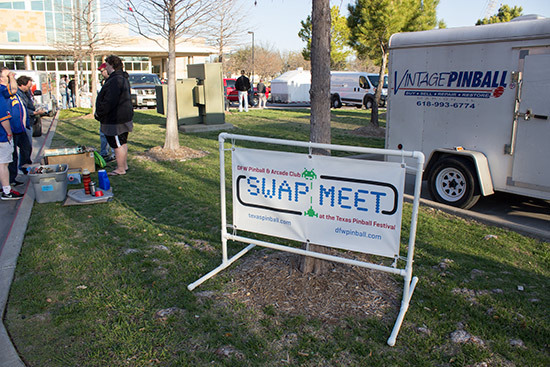 Earlier in the day, Saturday events began at 8am with the swap meet in the car park just outside the Convention Center entrance. 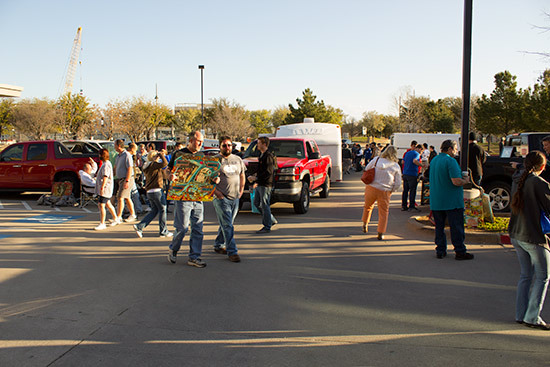 The weather was good but there were fewer sellers than last year. Despite that, there were some good deals to be found. 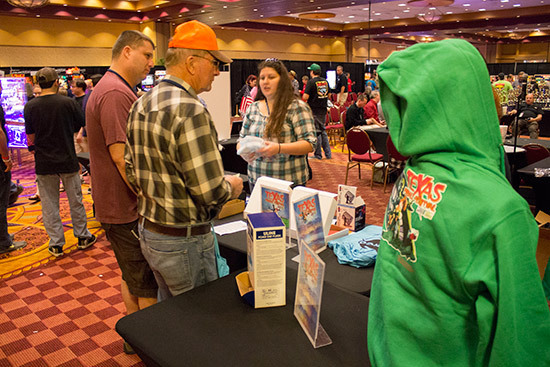 Seminars are a large part of the TPF schedule and this year was no different with the first at 6pm on Friday and the last at 10pm on Saturday. Here's a summary of what was said at each along with links to videos shot by the good folks at the Arcade Repair Tips website. 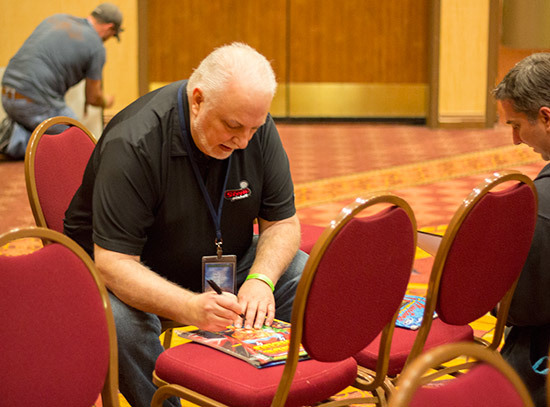 Gary spoke about his tour schedule for the coming months, visiting pinball and trade shows around the world, before turning to the current state of Stern Pinball. He said they would continue making about three new titles a year, each in a number of different configurations. There would be no more AC/DCs made, as the current licence to make them has expired and it wasn’t planned to renew it. However, they do plan to make more Mustang Pro and Premium models, The Walking Dead Pro and Premium, Star Trek Pro and Premium, and Metallica Pro. Gary used the term ‘studio game’ to describe a model designed outside of Stern but manufactured by them, such as Whoa Nellie! – Big Juicy Melons. He said they had shown the game at the ASI show a few days earlier and the reaction from operators had been excellent. He also said he thought the rerun of Medieval Madness, also made at the Stern factory, wasn’t for operators due to the high cost. Given recent events, Gary talked about the need to respect licensors’ intellectual property, and how that also applies to the rang of accessories Stern now sells. He also spoke of the company’s impending move from Melrose Park to Elk Grove Village. He said they will start moving “soon” with April 17th as the last day at the old location. 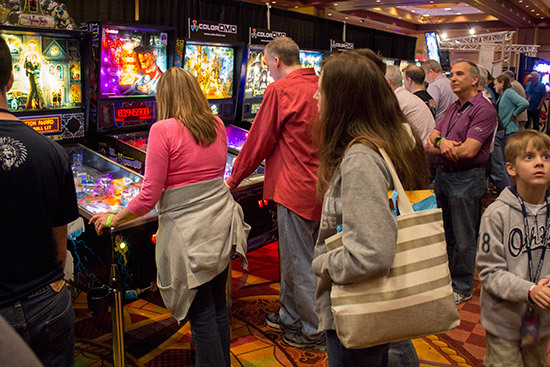 When asked about the status of Stern Pinball’s The Pin model, Gary said they are redeveloping it and will have a new version to show in Q3 2015. He said the The Pin model needs a new distribution channel and a different price point. The Pin used a cut-down version of the new Spike boardset currently being used in The Walking Dead and future games. However, he said games made under the Vault Edition brand would continue to use the original SAM boardset. 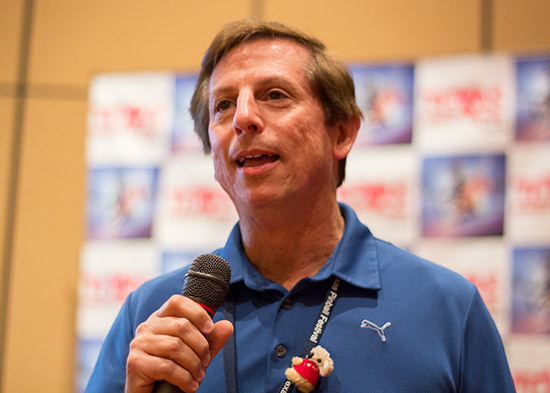 Steve began his seminar by thanking everyone who worked with him on the Star Trek game, describing what each of them contributed to the final product. He said he is happy with where the game’s software is right now following the most recent release. He would like to see some better lighting effects to indicate when each mission is completed, but couldn’t say whether there would be any further updates. 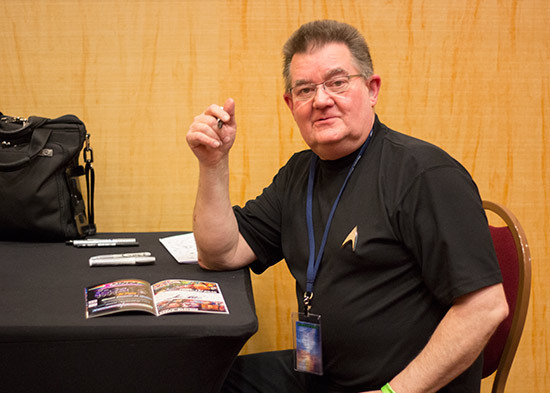 He said working with the Star Trek licence was initially a nightmare, although things improved further down the line. In contrast he said AC/DC was a dream. Their team was very willing to work with Stern to produce a great game, he said. Going back to his days at Williams, Steve reminisced about some of the pranks the design teams used to perform on each other, and some of the disparaging nicknames they used for other teams’ projects, such as Bad Game (Bad Cats), High Cost (High Speed), No Fun (No Fear) and Vomit (Comet). Steve was asked if he appreciated input from fans when designing his games. He replied that he has to please a huge array of players, which maybe not everyone appreciates. He tries to design for everyone and wants everyone to love them. 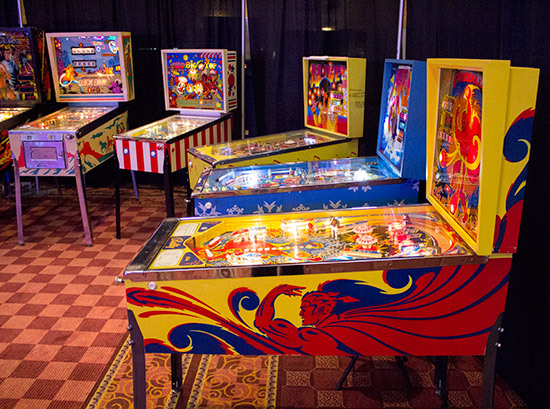 He said he felt bad for the various start-up pinball companies, as it takes a lot of time and far more money than anyone thinks. 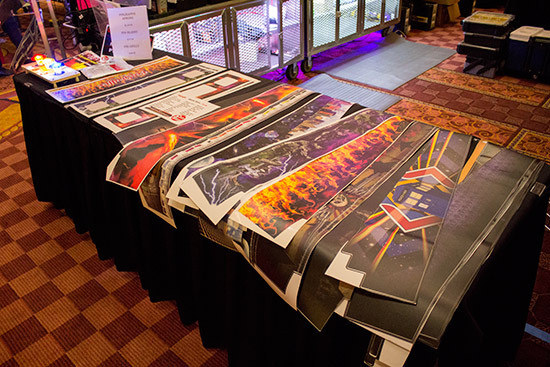 After Steve's seminar the various game designers present at the show came to the seminars room to autograph items brought to them by fans of their designs. 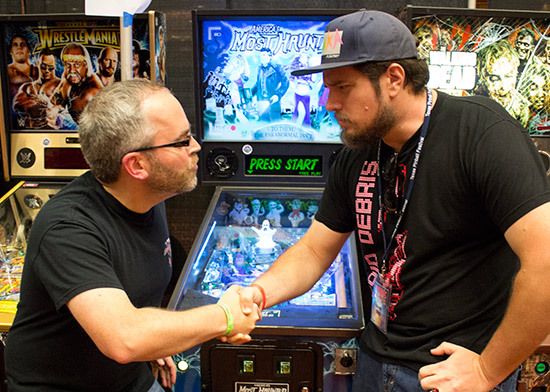 Brett said he wanted to talk about the technological changes he is seeing in the pinball business. 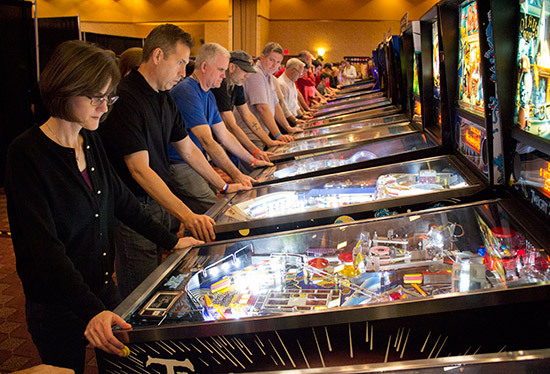 He began by describing the legacy technology still in use in pinballs today, such as transistors, linear power supplies, discrete logic chips and incandescent lamps, and then showed how more advanced products had come along to replace them all. MOSFETs had replaced transistors, while switching power supplies embedded processors and LEDs had produced more efficient and more flexible alternatives to their analogue predecessors. Brett said that by 2020 all incandescent lamps on sale in the US must have 200% the efficiency of lamps from 2012 or earlier, and because such efficiency gains are not currently possible, incandescent lamps will be phased out there completely. 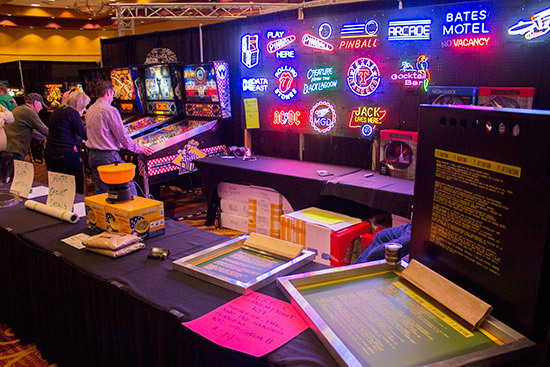 However, the Energy Independence and Security Act of 2007 exempts lamps rated below 40W, so pinball lamps seem to be safe for now. Brett then described the problems people have experienced using LEDs for their game lighting and explained how his company XPin had created their XP-BLYFF driver board to eliminate LED flicker in Bally games. He said a Williams version is currently in development. He also spoke about the company's new 7Volution 6 to 7 digit conversion displays which allows classic Bally and Stern games to record scores ten times greater than their usual limit of 999,990. 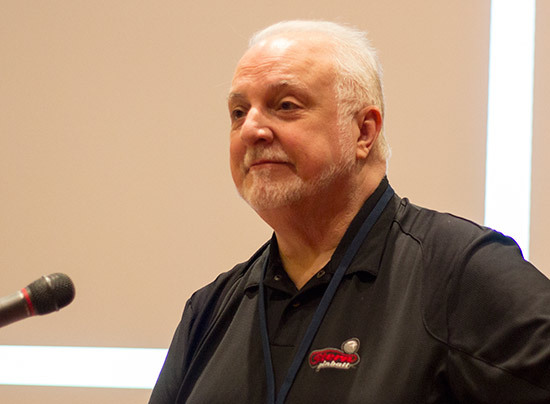 Gerry also began his seminar by talking about the evolution of pinball since its earliest days and how the market for new games currently stands. 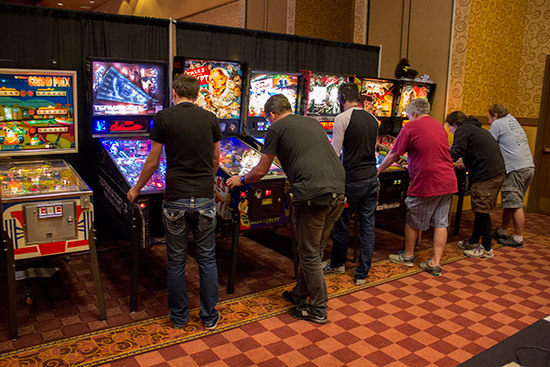 He said there are many small-scale pinball businesses and he warned that some of them would drop out before they manage to bring a game to market. But, he said, the demand for new games is still growing. He listed the issues he thought needed addressing to make pinball ownership more affordable and the games more technologically advanced and reliable - price, serviceability, floors pace, artwork, lack of innovation, incomplete code, the uncertainty of the pre-order model, and the inability of most people to make their own games. Gerry showed a video of the latest version of the first game from his company Multimorphic - Lexy Lightspeed: Escape from Earth. 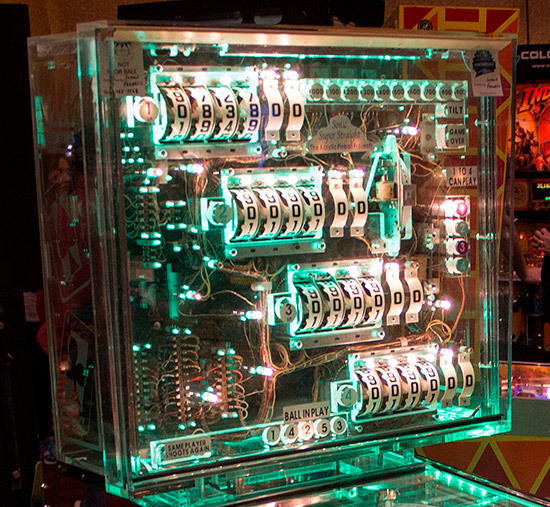 He talked about how the modular design of the P3 allowed a wide range of hardware mechanisms to be incorporated into games, along with the fully-swappable upper playfield module. Gerry said they were about to make available the details of the software and hardware specifications to allow people to write their own games and create their own modules and upper playfields. The option of mounting an LCD monitor in the backbox is also being explored, but Gerry said they are now just three months away from shipping their first P3 machines. 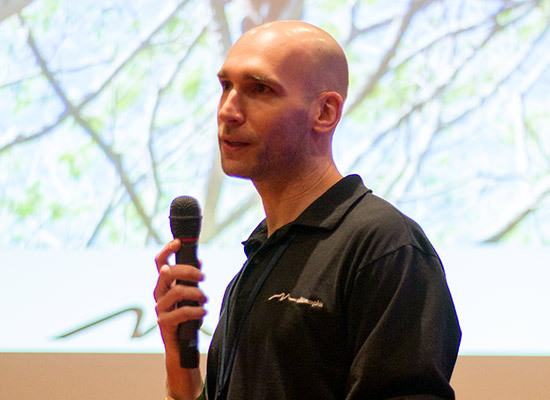 He hopes to be able to produce two games a year, either created in house or built by third parties and released through Multimorphic. 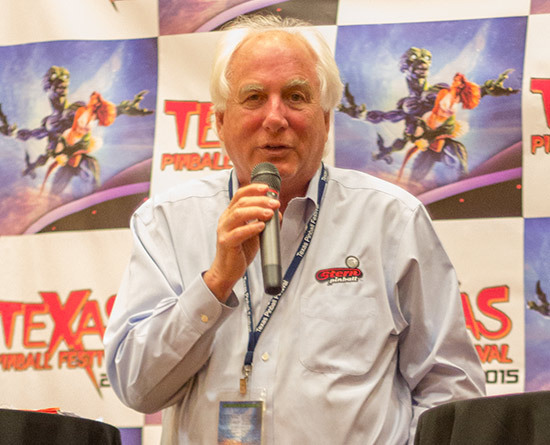 Talking about the second title the company had been developing, Gerry said Cosmic Cart Racing won't be ready at the launch of Lexy Lightspeed but is still under development. Buyers of the P3 can choose whether to include it in their initial purchase or wait for its release at a later date. Saturday 1:30pm: John Trudeau - I’m Back! 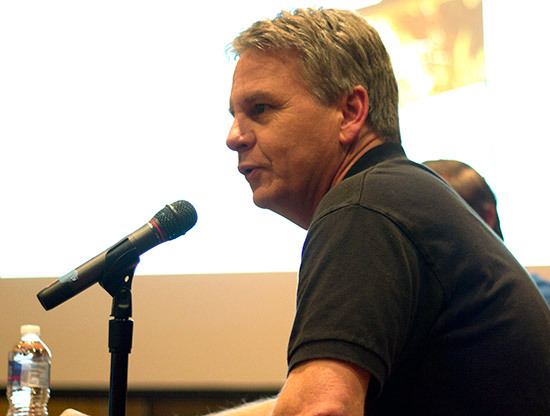 John chronicled his career in the pinball industry, starting with his first game working for Game Plan, Global Warfare, for which he did the artwork. 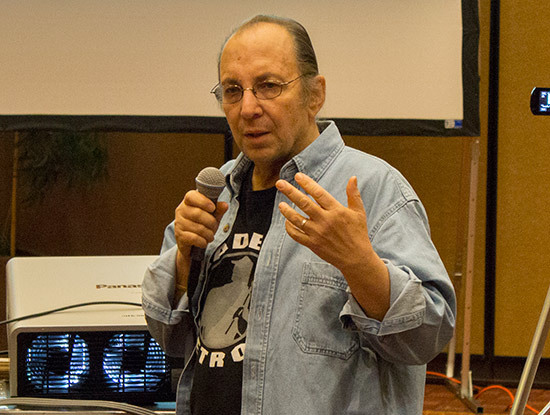 Game design was by Ed Cebula, who John said was his mentor. When a game designer position at Gottlieb became available, John applied for it and was selected alongside Tom Szafransky, who went on to design Devil’s Dare and Punk. John continued through his early games at Gottlieb, such as Rocky, Spirit and Q*Bert’s Quest. All his designs were widebody machines through to Q*Bert’s Quest, which coincided with the change of management and company name to Mylstar. It would be another ten years before he designed another widebody game – Judge Dredd. 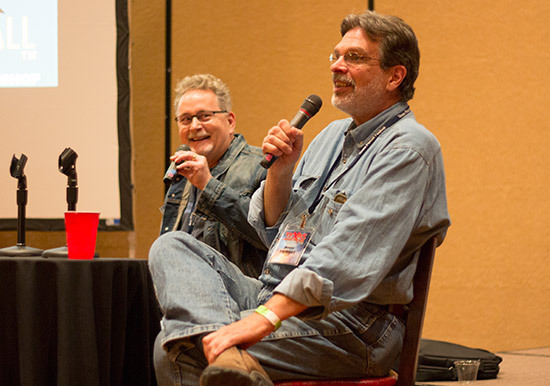 Greg told how he became interested in art from reading Mad Magazine as a kid. He then showed some of the games on which he worked before he met Dennis, such as Fathom and Harlem Globetrotters. He continued with some of his later games including Star Trek: The Next Generation, No Fear and Revenge from Mars. 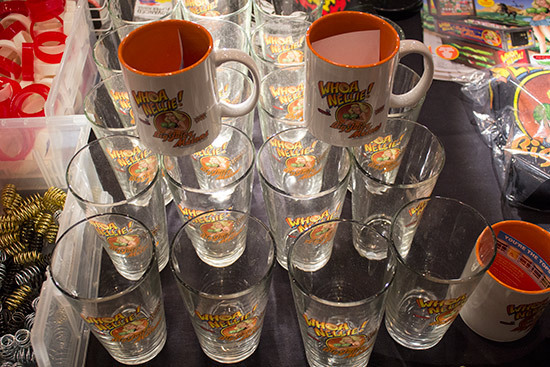 Some of Dennis’s earlier games prior to his teaming up with Greg were then shown – games such as Blackwater 100 and Special Force – followed by their early collaborative games; Elvira and the Party Monsters, Dr. Dude, Party Zone and then the later Scared Stiff. 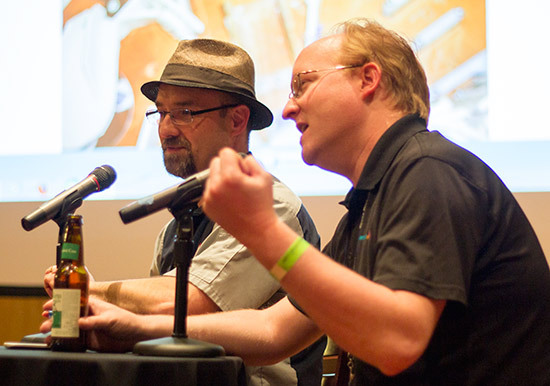 After being reunited at the NW Pinball Show in Seattle in 2009, Dennis and Greg talked about collaborating on a custom pinball game. Dennis has bought a Continental Café following the exhibition ‘The Art of Pinball’. Greg said they wanted a design based on fruit crate labels and classic pin-up art, and this is how Whoa Nellie! Big Juicy Melons began. 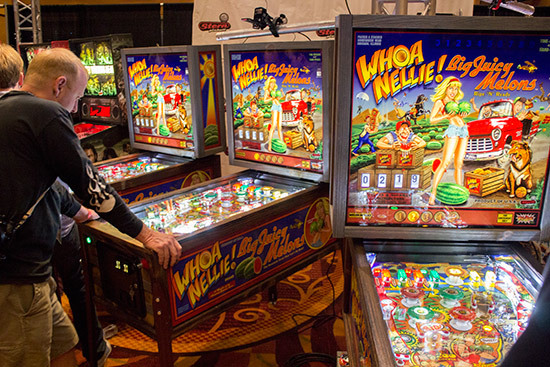 Although Continental Café was a two-player game, Greg and Dennis decided to make Whoa Nellie! a single-player game so they could have more backglass artwork. 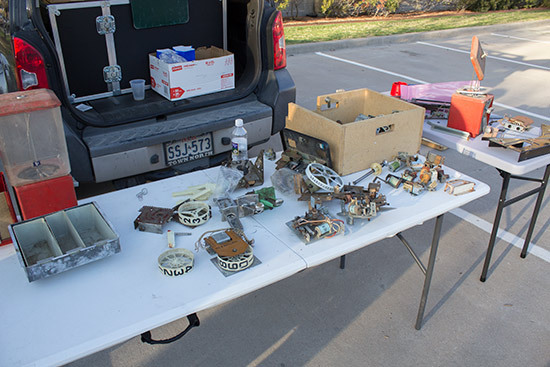 They originally made four conversion machines – 3 electronic and 1 electro-mechanical. 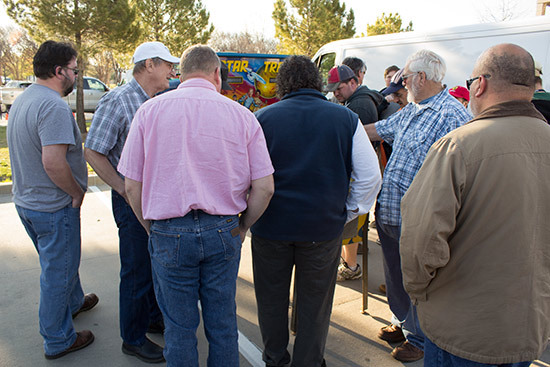 Greg said that when the opportunity arose for further machines to be built by Stern Pinball, the original buyers were all happy for the project to go ahead. Dennis and Greg decided to change the gobble hole from Continental Café into a kickout saucer for Whoa Nellie! because they thought most players wouldn’t understand what a gobble hole is or how it worked, and would be left wondering what happened to their ball. Manufacturing of Whoa Nellie! took longer than expected because the new machines were designed to run on Stern’s new Spike control system, but that system was only introduced with the recent WWE Wrestlemania machine. Dennis said Whoa Nellie! 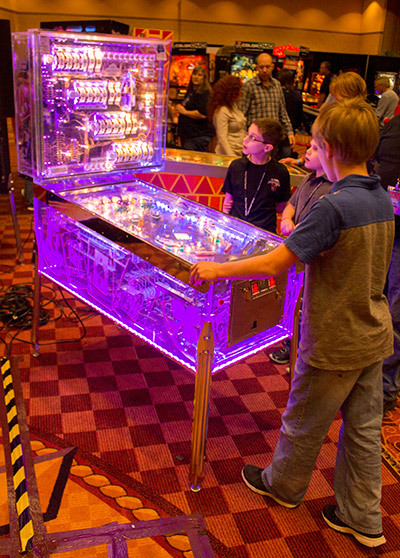 is a good way to introduce new players to pinball without making them feel intimidated by the complexities of a modern game. 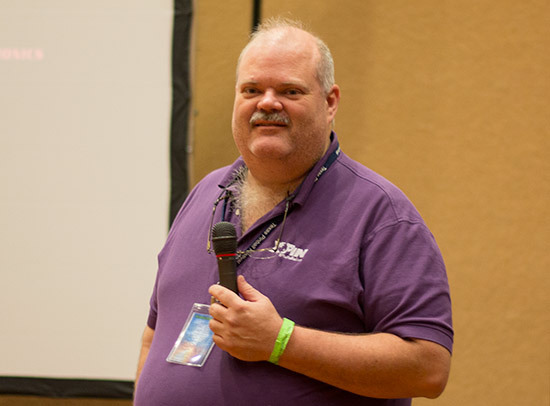 After introducing himself and Butch, Jack spoke about how they are still building The Wizard of Oz machines at the Jersey Jack Pinball factory, and how there will soon be a new version of software featuring the Pindemption feature we showed in our EAG-Expo show report. 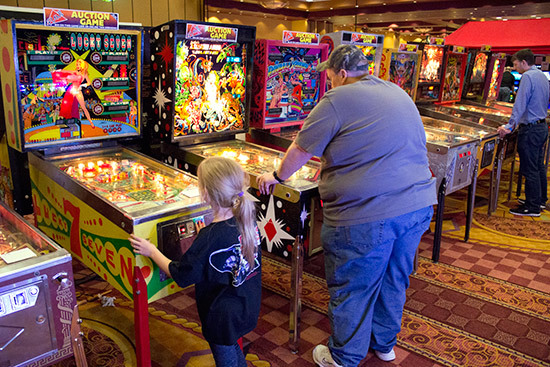 This, Jack said, brings pinball to people who didn’t realise they still made pinballs, and followed Jack’s ethos of building things which had never been done before. 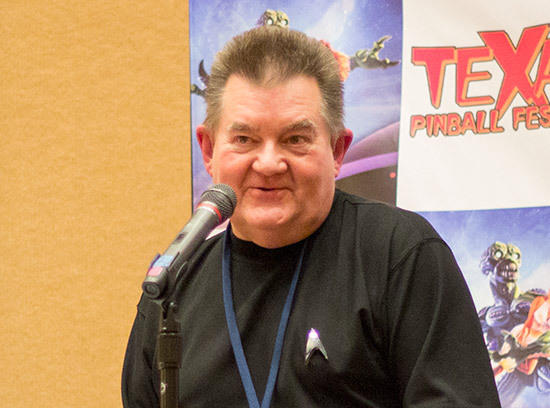 Butch then spoke about how the wiring in The Wizard of Oz was too complex and had been redesigned and simplified for their second game – The Hobbit. That game will also feature a new LED lighting design to increase reliability. He showed the different revisions of The Hobbit’s artwork, going right up to version 16. 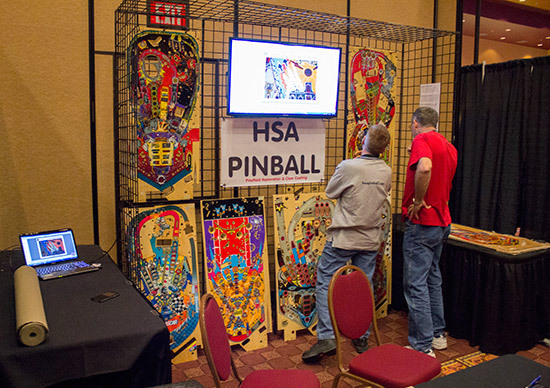 Jack said the reaction to the artwork shown at Pinball Expo was less than positive, so he told the team they had to redesign certain areas of the playfield before its next outing at the IAAPA show in just three weeks’ time. Butch continued by showing the many display layouts which were considered and explained how the chosen one was picked. Jack concluded by saying he wants to get away from the pre-order model for their third game which will be unveiled later this year and be available to buy soon after. He said if he announced the title of the unlicensed game now, he’d have to spend six hours explaining what the game is all about. He did say the complete design was not yet finished, but it will be a fun theme and not a dark game. 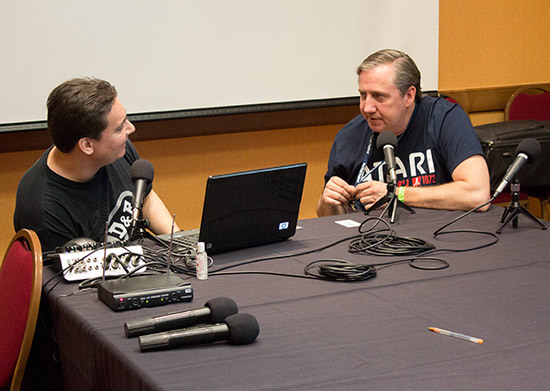 Spooky Pinball’s Charlie Emery and Ben Heckendorn interviewed each other in this third seminar of the day, and Charlie began by talking about how he gave up his printing job to start making pinballs. He had previously made his Godzilla game, and then teamed up with Ben who had made his own Bill Paxton and Lost games. Lost was a proving ground for the playfield printing process which was eventually used on make playfields for The Wizard of Oz. Ben decided if he was going to continue making pinballs he needed to come up with an unlicensed theme. He’d been doing some spooky stuff on his show, so he devised a number of features and a layout for his game which became America’s Most Haunted. It started out as Ghost Squad, he said, and included a full-size LCD screen in the backbox, although this was later reduced to a dot-matrix display. Charlie said when it was time to get the game ready to build, he had the job of turning all the foamcore, paper and cardboard pieces into properly-computerised models. Ben explained how programming the game was the hardest part of the whole design process, taking up 80% of the total time for the game. 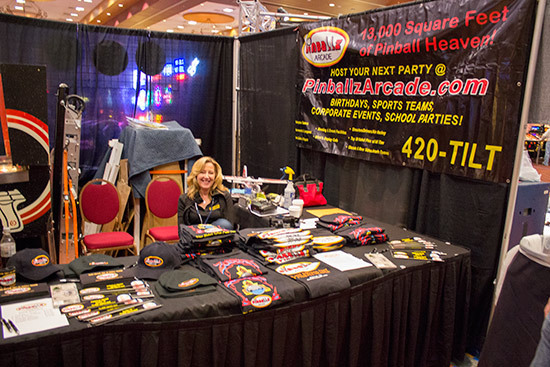 Charlie said this weekend had been great for them, lifting sales from just over 100 to the point where they were close to their maximum of 150 machines. They are now making 2 or 3 games a week in their factory, but want to increase that to 1 per day. They then talked about their second game together. 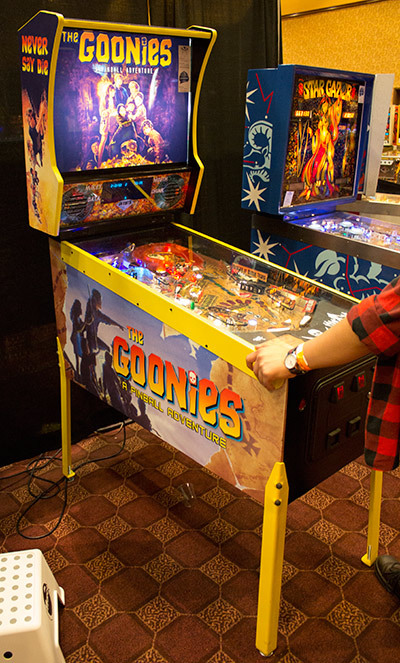 It will be a licensed theme and will have a limit of 300 machines. The theme will have a vaguely spooky feel to it, and the art will be created by a well-known artist. The game will be priced at $5,995. 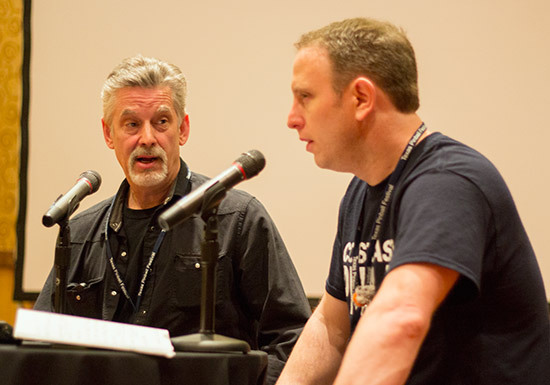 This special edition of the Coast-to-Coast podcast consisted of Nate Shivers conducting an interview with pinball designer Mark Ritchie, looking back at Mark’s career making games at Atari, Williams and Capcom. 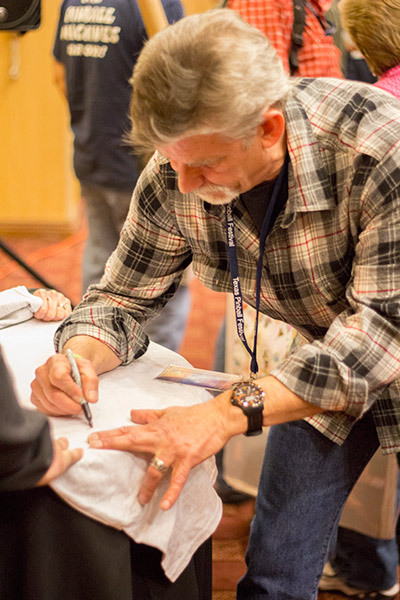 Mark said he’d never dreamed he would become a pinball designer when he first started as a line worker building the game Atari Football. It was during that time that the company said they wanted to start a pinball division. Their first game was Atarians which, Mark said, was a disaster. It took until they were making Superman before most of the hardware issues were ironed out. Mark moved to Williams as a technician from where he came up with his first pinball design called Thunderball. He showed it to the company’s management and they built ten prototype machines but, he said, it was too unconventional and had too many features on the playfield. He then talked though his subsequent games, starting with his first pinball - Firepower II – and the pitch-and-bat game Pennant Fever, right up to his final games at Williams – Fish Tales and Indiana Jones. 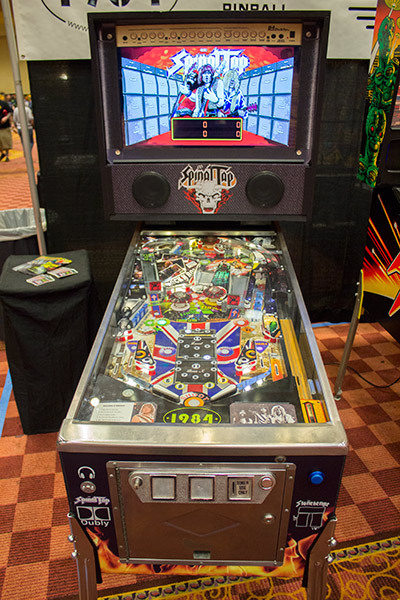 His final pinball design to date was for Capcom’s Kingpin which never went into production due to the closure of Capcom’s pinball division. Mark said it wasn’t originally going to be a gangster-based theme and had started out as a timed game, but reverted to a more regular 3-ball style of play which, he said, was much more fun. 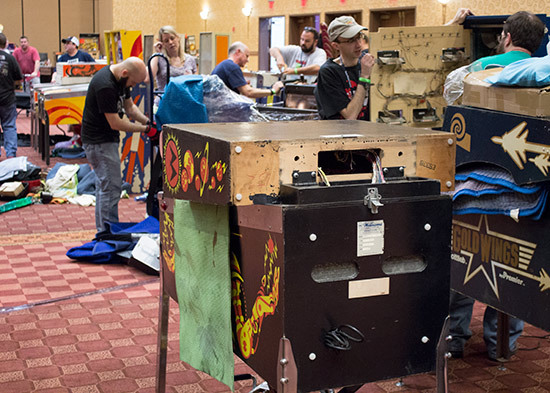 At the end of each day, the Arcade Repair Tips team produced a round-up of the days events. 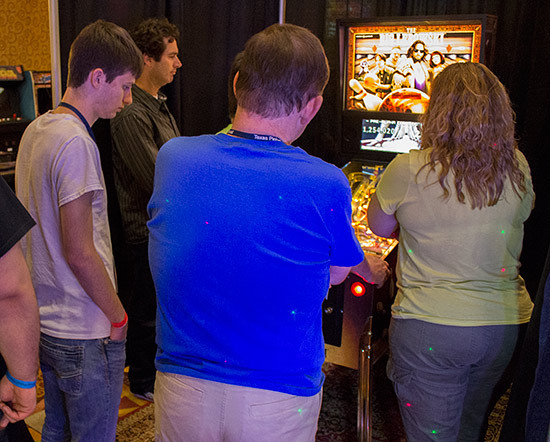 This year the Texas Pinball Festival had its usual plethora of pinball tournaments. There were so many that it was hard to work out how they differed and why. Although it would have been fun to compete, the lack of clear information, the complicated qualification process, and lengthy play-offs (running until 2am on Sunday morning due to problems with the scoring system) put the tournaments out of reach of all but the most dedicated and competitive players. 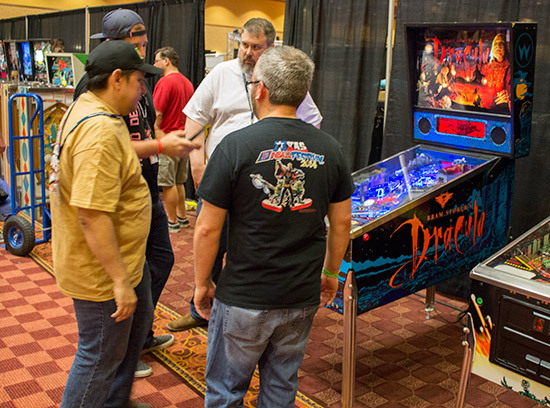 Nevertheless, there were five main IFPA-accredited tournaments - The Texas Tilt (DMD machines), Texas Shoot Out (also DMD machines), Texas Vintage (EM machines), Texas Retro (solid-state machines), and the Texas Wizards (a mix of machines). 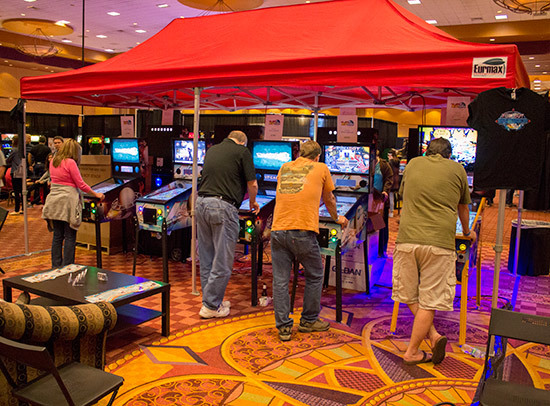 Each tournament had three divisions of play (A, B & C) and cost $3 per game or 2 games for $5. 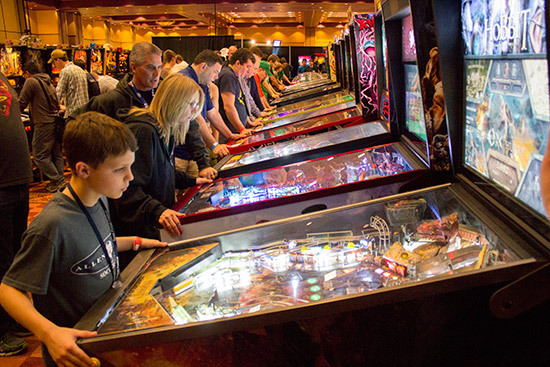 Players in each had to play on six machines, and unlimited qualifying attempts were allowed during the Friday and Saturday qualifying periods. 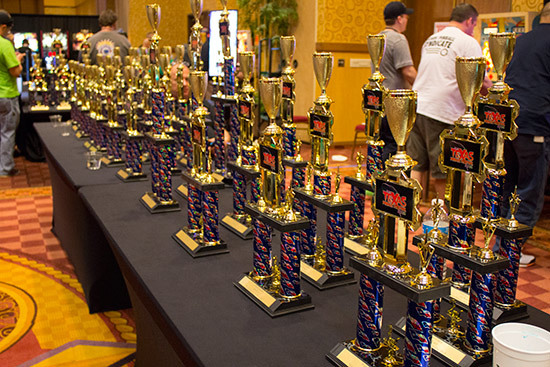 All tournaments awarded trophies for the top three in each division, with $300 cash for the winner of the A Divisions, $200 for second and $150 for third. 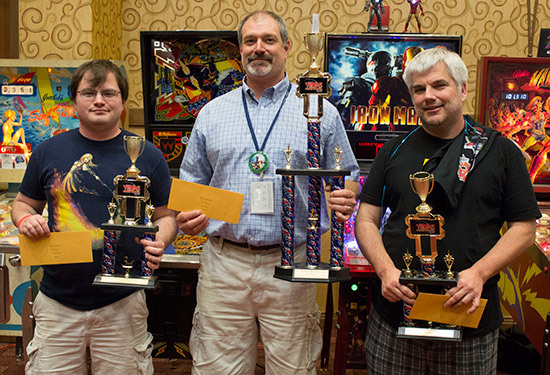 Smaller prizes were awarded in the B Divisions ($125, $75 & $50). 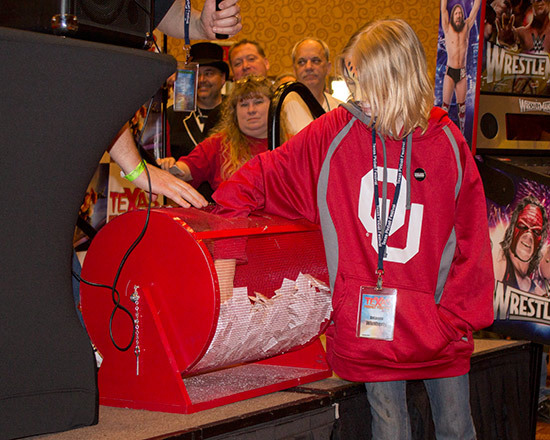 There were no cash prizes in the C Divisions. 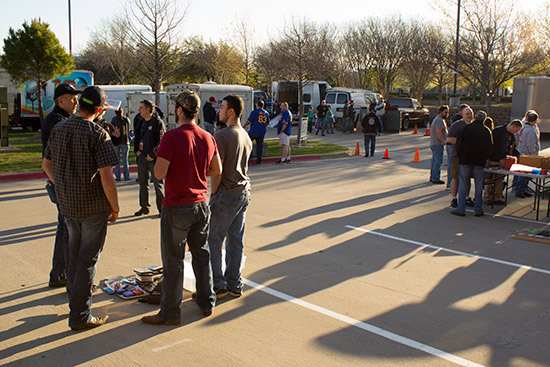 There were also two tournaments for kids to enjoy - a Parent/Child event and a Kids Bump 'N Win competition. 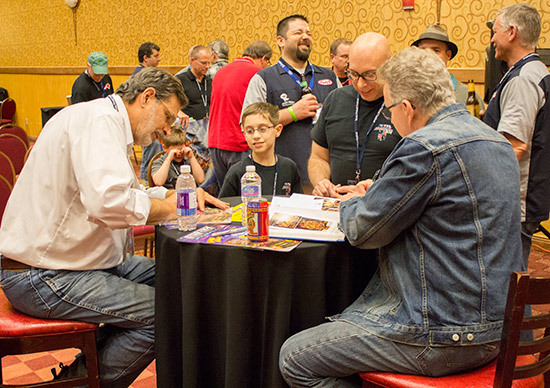 In the Texas Wizards tournament, the C Division was won by Don Thompson, with Brett Emerson second and Scott Kutheis third. In the B Division it was a win for Keith Shahan, Chris Compton was in second place and Mark Meserve in third. The Wizards Tournament A Division came down to a battle between Colin MacAlpine and Garrett Hays. There was a brief hiatus when the Dracula machine refused to launch any more balls, but the situation was soon resolved. Eventually the pair moved to Paragon and the final was decided when Colin MacAlpine won the game to take first place. Garrett was second, while Bob Matthews won the play-off to take third place. 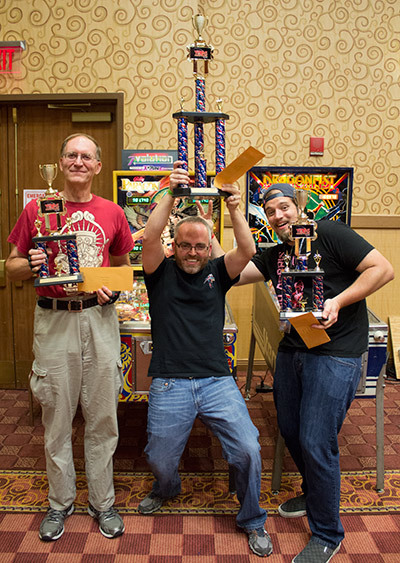 All the other winners can be found on the Texas Pinball Festival website. 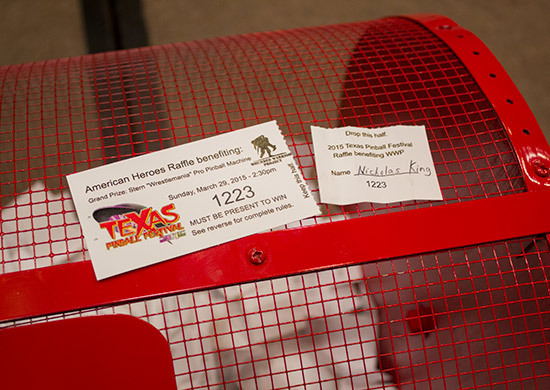 Another winner at the show was the owner of the ticket drawn out for the main prize draw. 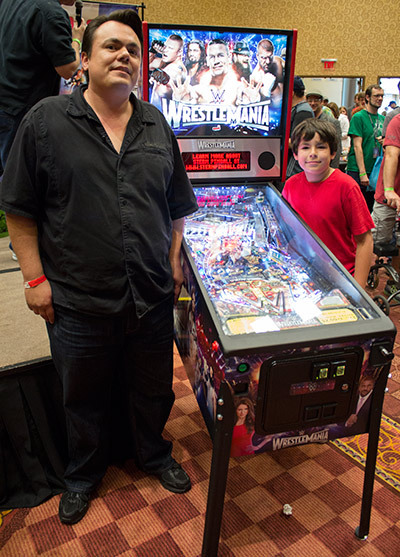 Nicholas's prize as this brand new WrestleMania Pro pinball machine. 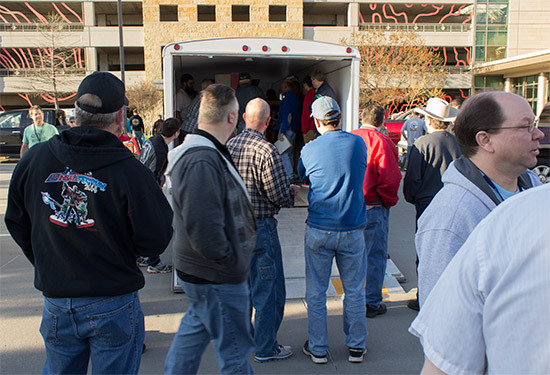 Finally, the TPF gives Best-in-Show awards to the collectors who bring their machines along. 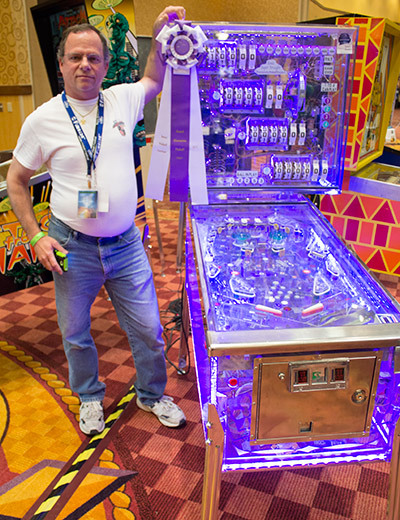 The overall Best-in-Show award was presented to Shawn Farwell for the Acrylic Pinball Project featured at the start of this report. 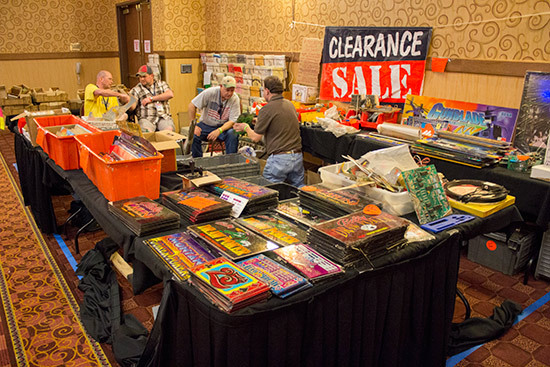 Then it was time to pack away all the machines and stands as the 2015 Texas Pinball Festival came to a close. 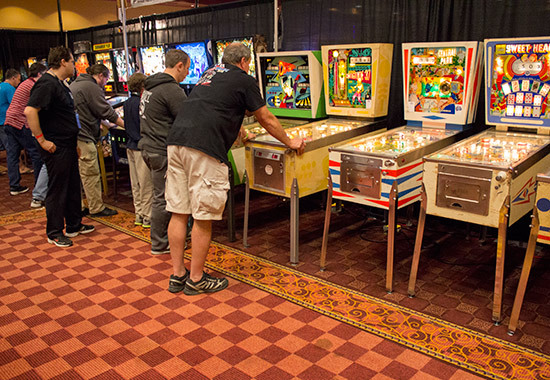 2015 was another great year for the Texas Pinball Festival. 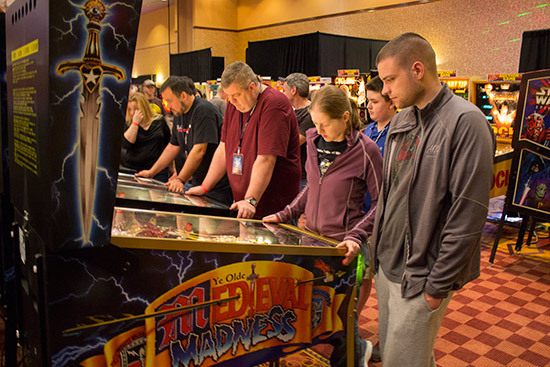 It was well attended by guest speakers - at times it seemed like most of the Stern Pinball game design department was in Frisco - and it was very well supported by local collectors, with an impressively wide range of top restorations and custom machines amongst the 430 games in the hall. 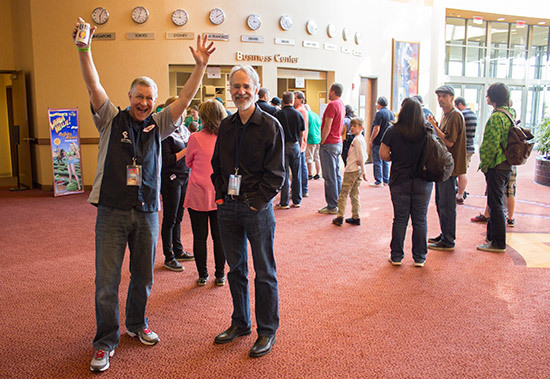 A large team of volunteers staff the registration desk and the entry desk, run the tournaments, check-in machines, organise the seminars, answer questions and check wristbands all three days of the show. 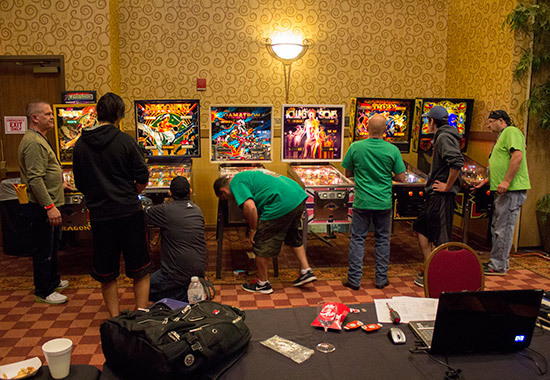 So thanks to them and everyone who helped make this year's Texas Pinball Festival another hugely impressive and enjoyable show.